This was not in the plans! Our day started off really lovely yesterday. We woke up early and headed out for an early morning trail ride with friends. I met up with my friend who bought Top Punch. I can not tell you how happy I am for her and for him. He led the whole trail ride up and down the steep hills, through the woods and open fields. He was quietly walking/trotting along on a loose rein never glanced at a thing. I asked her if he ever spooks at anything as I just could not believe how amazingly brave he was but she said he rarely looks at a thing. My husband is now riding my conn/tb and having a blast. I thought he might be scared by some of the hills but he had a blast. My horse is a bit on the hot side always bouncing up and down but hubby is not bothered by him which is great. We headed home with our horse and got them unloaded and then loaded up Dixie for our two hour trip to drop him off. The plan was to meet his new owners at the Prince George Eq Center in Upper Marlboro, Md. We got about 1/2 mile when the truck started sputtering..oh no. Hubby eased off to the side into a Ford dealership and said we were done for the day and going no further. He thinks it is the fuel pump. Love our truck but lately it is falling apart. I call Dixie’s new owner and relay the change in plans and they come over to meet us. We unload him in the middle of a car dealership and he was a bit confused by it all but loaded quietly up on their trailer. She called to let me know he had settled in well and was super relaxed about his new barn. We waited for close to 4 hrs for a truck to tow us home but thankfully we did get a ride home. We have US Rider coverage and I strongly recommend them to anyone who drives a truck trailer. They are wonderful to work with and we have needed there services several times over the past few years. They cover you no matter what vehicle you are in and even if you are a passenger in someone else’s vehicle. 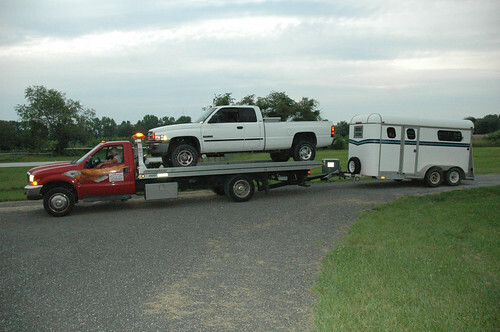 It was $395 to get towed home and our coverage allows for 100 miles or $400 which ever comes first. We had a really bad day but it didn’t cost us anything and we were lucky enough to be able to find a parking lot to unload the horse and he got home safely. Dixie has been sold to a reader of his blog 🙂 You just never know who is reading and thinking they must have this horse. Sometimes when a horse has been for sale for a long time people think there must be something wrong with them but over the past year he has been advertised I only had three people see him. One came when he was first advertised and he was still super green. The next person was a foxhunter but looking for something a bit more made and the next person really liked him but he just wasn’t quite the right one. The fourth person was the charm. His price was low, then high and then dropped recently as we just needed to move him along to free up space for more horses. Wouldn’t you know with the price drop tons of people were calling and emailing. No interest for months and months and then boom everyone had to have him. There was never anything wrong with him sometimes I think it is just all about the right time and the right person. His new owner is a reader of the blog and had been following him from the beginning trying to convince her husband she had to have him. We took a nice trail ride going up and down some banks, through water and mud and testing out the gears. He self loaded and unloaded and showed what a pro he is off the farm. 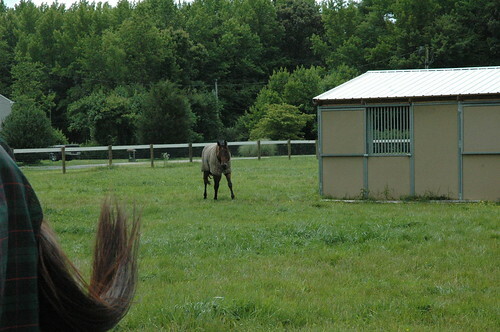 In his new home he will be trail riding, schooling some x-c and hopefully heading to some lower level events. She might even try foxhunting. He will head to his home over the weekend and I know she is going to love him because I will miss him like crazy. I am losing my foxhunter and my favorite go to horse when I want to have a fun ride. My hubby had really bonded with Dixie so now I am going to have to convince him to try out my horse on the trails and he is not to keen on the idea. If you see a tall man riding a fat conn/tb don’t laugh to much 🙂 He is worried my horse will be to spooky for him but I think he will be fine. Dixie had his vetting yesterday which was a spur of the moment decision but we wanted to make it work for our schedule. He had lost a shoe during our trail ride and we had to walk back on the rocks so needless to say he was sore on that foot! Otherwise he vetted out with no issues which is always relief for everyone involved. Yesterday was supposed to be a great day knowing Dixie had vetted clean and was getting a super new home but I had to deal with euthanizing a lovely animal. We had taken in a horse that we knew had a fractured sesamoid and he needed to be moved off the track right away. We were hoping he could be rehabbed but the x-rays were really bad and he had no chances of being pasture sound. It was the first horse that I had to euthanize but it was not as hard as I thought it would be because I was confident we were making the right decision. RIP Full Motion you were one of the good ones. Somebody left a note they wanted to see more pictures of the horses not in retraining and I finally had a chance to get a few this morning. When the horses come in they just get turned out and allowed to be horses. My stalls turn out directly into a sacrifice paddock which can then be opened to various other paddocks which are in rotation. 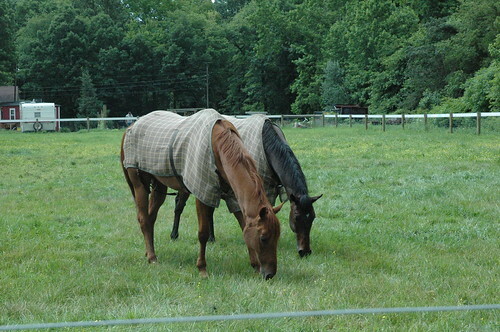 The horses just come and go as they please so sometimes you will find them out eating grass while other times they are in their stalls just relaxing. This is the week of the lost shoes. I am off work today and just saw View walking around limping. Of course shoe twisted so I took that off. Good thing the farrier is coming today. Dixie lost a shoe on a trail ride yesterday..so muddy! Archie lost all his shoes since he arrived. My horse is also missing a shoe. Fun times on the farm. Today is will be taken up by the vet and farrier. Dixie was standing in the run in until he heard me come out and then he was starting to walk over. Look at the lovely grass! This is one of my horses, Charlie. He is a troublemaker and pushed everyone else over so he could come and see me. He is a real lover! With a face like that how could he not be. View is to big for his fly sheet! His barrel is huge. Archie is a gorgeous horse and I am eager to see what he is like to ride. Right now his feet hurt and his body is still in the funk stages. Another month and he should be ready. We had another horse arrive who has a sesamoid injury. He will be getting some x-rays later today to see what his future holds. Lovely 3 yr who just wants to follow me around like a big dog. Tonight the hubby and I headed out to the local trail system. I was planning on riding my young horse but he pulled a shoe so instead I had to ride my fat boy who had already gotten ridden but it wouldn’t hurt him. We finally remembered to take our quiet ride masks with us. The mosquito’s are horrible this year with all the rain and this trail system is mostly wooded but lots of water everywhere you go. My hubby has gotten in a real groove with Dixie and was leading the trail today which is great. He normally likes me to lead just in case the horses spook (the horses in front always spook first). Dixie wasn’t spooking..he rarely spooks but hubby is a bit of a wimp (sshh..I didn’t say that). My horse doesn’t have shoes on yet so we decided to go down the dirt trail and then around the grass edge on the road and wind our way back. The footing was real swampy so we had to ride right along the road edge. Two motorcyles came by and of course they didn’t slow down but neither horse even budged. Gotta love ottb’s who are comfortable with traffic. Hubby was feeling relief that he survived the motorcycles when Dixie stepped on a plastic bottle. First he stepped on it with the front feet and it made a loud noise causing him to jump sideways and somehow it ended up hitting his back leg making him jump again. I was laughing because he couldn’t get away from this bottle and hubby didn’t know what to do. Finally they got over the bottle and we had a good laugh at how motorcycles are not scary but plastic bottles are. We got to the part where we had to cross the ditch to get back to the trailer and my horse wasn’t really sure about it as the grade was pretty steep down where they had to go down, over the water and then up a steep hill on the other side. I asked Kurt to lead the way just giving Dixie the reins and grabbing mane. Dixie picked his way through very gently. I swear he knows when hubby is riding. He didn’t even jump the tree on the path (hubby hates jumping!). It was a lovely ride but the bugs are getting really bad. The B-52 Bombers were out at least that is what we call them. Huge black horse flies that you can hear buzzing and they chase you down. Pretty soon we won’t be able to ride in there at all so we are enjoying it while we can. There is nothing that makes a person feel better than knowing you got the horse the best possible home. I like to think I am really good at matching up horses and riders. One thing about Tb’s is they are pretty good about telling you who they like and what style of rider they like but I can sit on a horse and pick out a person for that particular horse. Oftentimes, I talk to someone over the phone and think they would be a good match for a horse I might have. Matchmaking is fun! Today, I found out that my friend has decided to go ahead and buy Top Punch. She had another week with him on trial but he has shown her everything she needed to see. Solo trail rides, group trail rides, comfortable, smart, willing and just an all around classy horse. 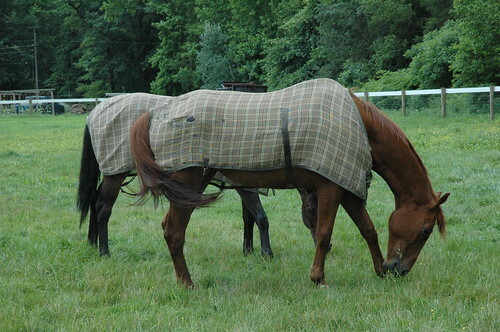 I can not tell you how happy I am to know this horse who raced up until age 12 will now be living the life of luxury. He will trail ride, fox hunt and maybe do some lower level eventing but his life will be easy and he will be spoiled. He already thinks that everyone should spoil him so nice to know that will be the case. 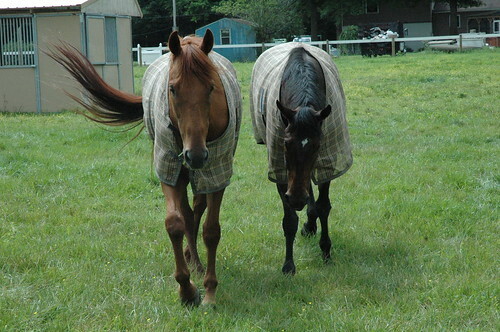 I love selling horses to my friends and family because I get to see them out and about on a frequent basis. I hear Punch is already getting a whole new wardrobe. Keeping a grey horse clean for hunting will be a challenge but I am sure my friend is up for it! Speaking of selling horses to friends and family there are some good pictures of Flint Hills that my mom sent me. He is the the first ever CANTER horse that I had come in and sidelines magazine is writing an article about horses in second careers and he will be featured. My mom just adores this horse almost to the point of annoying me with all her bragging 🙂 He has been in the ribbons at every single event with her and she has gained enough confidence on him she is thinking about moving up to Novice. That is a big deal for her and I am so happy to see her smile when she rides him. We also recently got some picture of the horse that I wish I could have had for myself. His name was Yellow Tavern and he was beyond incredible in my opinion. He came from the steeplechase track and I was able to ride him 3x before I broke my wrist and had surgery. The story is interesting how he ended up in his current home. His owner had called me about him and really wanted him but was headed to Philly Park to see a few. If she didn’t find anything there she was going to stop by and see him. She found a horse at Philly Park that she bought so she didn’t come to look. Another event rider wanted to see Tavern for herself so she took him in to test him out but that didn’t work out as he had pulled a shoe and hurt himself in the meantime so he didn’t pass the vet. 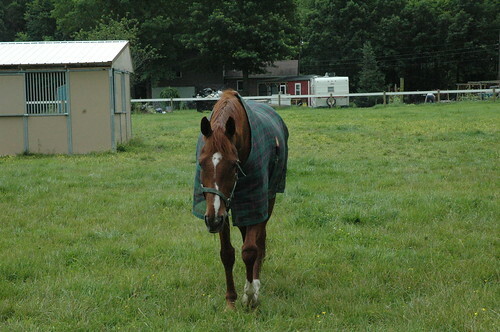 He then went back to one of the CANTER farms to hang out and colicked pretty badly. He was one big mess! I got a call from the previously interested person asking was he still around. She bought him and has been enjoying him ever since. He was a bit accident prone in the beginning so she is just getting started but I expect to hear some really good things. He just kicked but at a local combined test. The weather has been rain, rain and more rain lately. We have been trailering out to ride on some local trails that are very sandy so Dixie is about as fit as it gets. I rode him twice last week and my hubby also rode him. He is just so much fun to ride out on the trails and he makes me laugh with his silly personality. There was this huge puddle that was sort of deep and he slowed down and then just jumped in it like a kid doing a belly flop. He thought that was very funny. My husband loves how he can just ride on a loose rein and Dixie responds so nicely. He even did some cantering on Dixie our last trip out which is great for me because he rides a bit to slow for my liking but I don’t push him to canter if he doesn’t want to. We cantered a good stretch and he said it felt really comfortable to him. My other horse who he rides is so big and has the biggest stride and a bit of a hard mouth so I think he gets intimidated by the canter on that horse. Saturday we headed to Wye Island for a paper chase. A friend came along to ride Dixe and I rode Junior, my conn/tb. Junior is rehabbing from a knee injury and I taught we would be out about 2 hrs which was within in fitness level. More like 3 hrs! In the beginning, my horse was ready to go and Dixie was totally chill. Then he woke up a bit after we got some good trots and canters under his belt. It is interesting to see how much he has changed. He is just not in a hurry to get anywhere. My friend had ridden him at a x-c schooling in March and said he felt much improved in terms of his comfort level with contact and his canter was really much better. Good to hear that feedback! Wye Island is a beautiful place to ride with huge open fields and lovely paths to trot and canter. My horse was full of go the first hour and the last two hours his head was hanging and I felt really bad that he was so tired so we eased back in. Dixie is just a pleasure to ride. He knows his job but he could go all day. He is what I call a forward horse with a great brain. Very adjustable and behaved but no mistaking him for another breed. My friend said he felt like he could have cantered forever but was never in a hurry to go any faster just happy to be going along. My mom was also there riding the former CANTER owned horse, Flint Hills. She brags about him all the time but she said she had the best ride she thinks she ever has had 🙂 He really is an awesome horse so it is pretty darn rewarding to see her having so much fun. I am going to check to see if the public is allowed to ride there so we can go back. 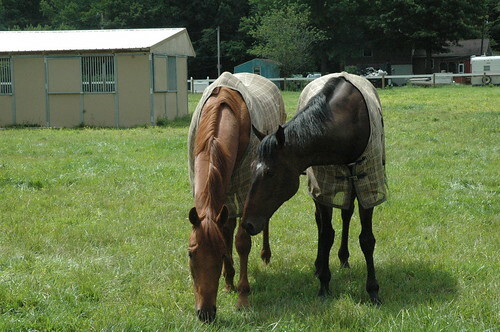 It is an incredible place and just a lovely area to condition the horses without stressing their legs. Not a lot of exciting things going on with my horses lately. Like everyone I have really tightened up the outflow of cash so I can focus on not incurring anymore debt and trying to pay off some of what we have. That means the showing and lessons are limited but that is just the way things go. My fun fund depends on horse income whether it comes from retraining, boarding or sales so when they slow down so does everything else. We are still doing a lot of training and this weekend we are heading to a paper chase sponsored by my hunt club. The chase will be at Wye Island which is an amazing place to ride. We got to hunt there twice this season and it was a treat to enjoy the beautiful scenery. I know some friends are coming along. My mom might end up riding Dixie if she isn’t taking her horse and if she rides Dixie then I will ride another horse. My friend has Top Punch out on trial right now. We aren’t keen on letting horses go out on a trial but I know her and she takes excellent care of the horses so it should be fine. She has already trail ridden him around the farm and over the weekend she joined a group of friends at Fairhill, Md for a trail ride and he was really good. Apparently, he isn’t sure about water and we have a lot of that laying around right now. She has put on some muck boots and lead him through it to get him used to it. He should figure it all out soon enough. She hopes to make him into her next foxhunter. I won’t speak for her but I do believe she was almost suprised that he was so quiet and laidback. I am a good reader of horses and am pretty good at matching horses up. When she told me she sold her horse I knew I had her next horse in my barn if I could convince her to come and look 🙂 Her last TB was a lovely horse but just not suitable for the job she wanted him to do. When you have a horse that doesn’t want to do the job and you have to deal with the antics that come along with that it takes away a lot of your confidence and enjoyment in riding. She wasn’t sure she wanted another TB but I reminder her that you just have to find the right one 🙂 I gave her Punch for 2wks to test out so she would feel confident in her decision. I hope it works out but if it doesn’t no big deal. He is a class act! Dixie didn’t get sold which is okay with me. It will happen soon enough and in the meantime I have a fun schedule for him finances depending. He is headed to the paper chase this week which should make him really happy. I have a few jumper shows and events in mind as well if the weather cooperates. I want to get a small camera I can put in a pocket to take some pictures when out on trail rides and paper chases. I might look around on ebay for something. Looks like a rainy week again! It is really raining with huge cracks of thunder this morning.